CCCamp is essentially over. I’m currently at Fabienne’s in Berlin and wanted to get something up quick while I’m on a decent internet connection. You can check out my pictures from camp on Flickr. 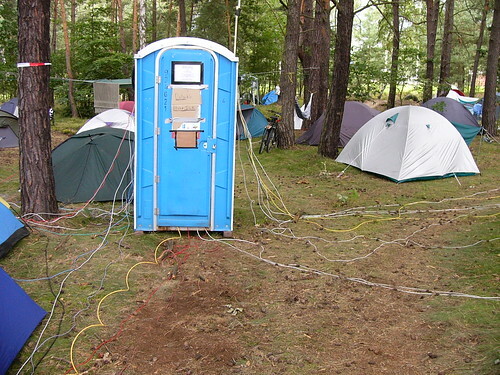 Pictured above is one of the camps ubiquitous Datenklo. It’s the ethernet wire closet found at the ends of camp’s fiber optic runs built inside of a water closet. This is probably the coolest thing I have seen on a camping trip ever. What is CCCamp? CCCamp is a computer security conference that took place on an ex soviet airbase in Germany near Berlin. It lasted an official five days and had lots of lighting and art installations too. Everywhere had power and ethernet: the forest, the hammocks, and the bunkers.